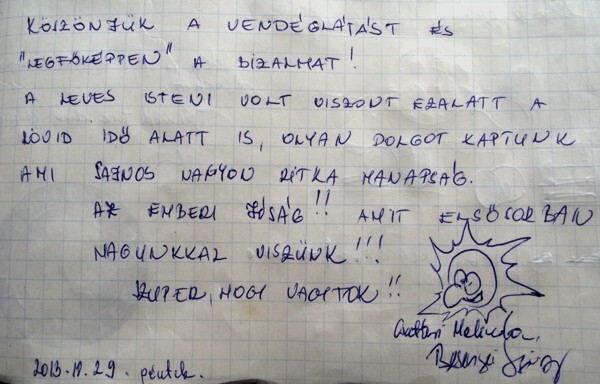 Hungary is not the land of high mountains, nor is it wealthy in terms of mountain huts. Yet, there are a few tourist houses that work on the same principle as their Alpine or Carpathian kin. 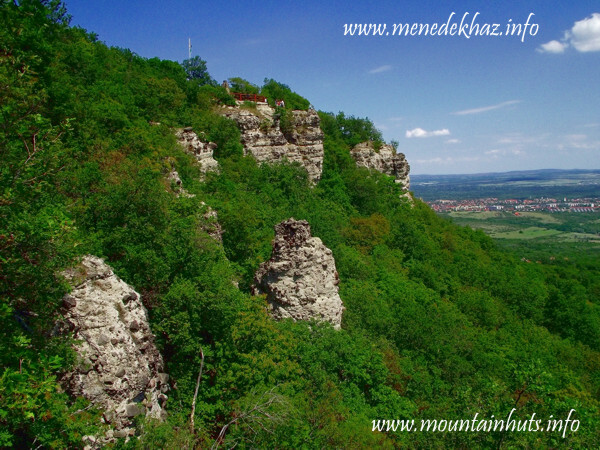 One of them is located in the Visegrád Mountains, between the towns of Szentendre and Pomáz, on the top of Kő-hegy. The name of this hill literally translates as Stone Mountain. Indeed, an otherwise gentle, forested hump features a group of scenic rocky outcrops (of volcanic conglomerates) on its SE side. Since the place is easily accessible for hikers, the hut is a very popular destination, or stop-by station, for many. Although one only has to ascend a mere 367 m high plateau to reach the hut, the atmosphere of this house is surprisingly similar to that of its siblings located in the higher mountains. 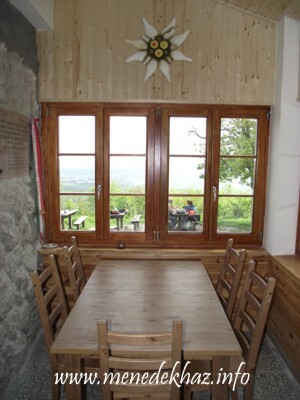 It is for this reason that I have chosen this hut as Hungary’s first hut to be reviewed on our website. The history of the house is a 20th century story typical of Hungary. After the country had lost its higher mountains in World War I, the attention of Hungarian hiking clubs was turned towards the remaining, modest mountainous areas. Following this trend, the Szentendre Section of the Hungarian Hikers' Association (Magyar Turista Egyesület – from this point referred to as MTE) decided to build a tourist facility on the nearby Kő-hegy, which offered a nice panoramic view over the Danube Valley. After ten years of preparation, the building was inaugurated on 23rd September 1933. Until 1940, it consisted only of a single storey (the current basement), whose flat roof served as a lookout point. 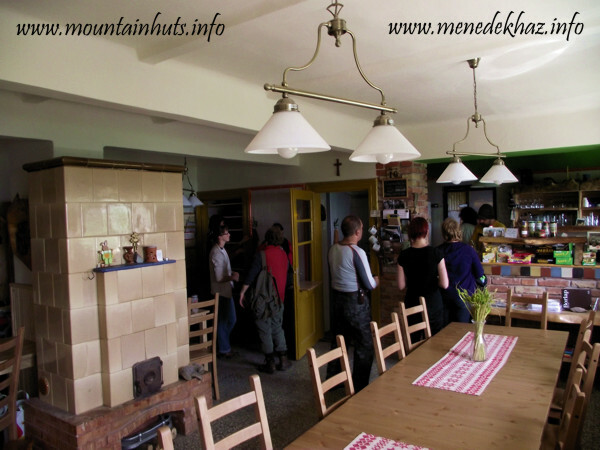 The hut was named after János Czibulka, the founder of MTE’s Szentendre Section. After World War II, the operation of tourist associations was gradually obstructed by the communist regime. Toward the end of this process, all privately owned mountain huts were nationalized by the state in 1949. In the next four decades, different operators were designated to run the facility, the last one being the Pilis Park Forestry Co. Ltd., which has exercised the state’s ownership to the present day. The hut was even closed down for a few years (between 1988 and 1993, during the period of rapid political changes) and barely avoided ultimate degradation and demolition (unlike a number of unfortunate tourist huts throughout the country). Although the meanwhile reinstituted Szentendre Section of MTE could not regain the ownership of the hut, at least they managed to win back the operating rights in 1993. The current manager of the house, Péter Schramkó (the surname is pronounced as "Shrum-coah"), has been running the facility since 2008. He and his enthusiastic team have improved the building a lot in the past few years (only to list the major works: windows and doors replaced, kitchen refurbished, heating and electric systems modernized, management and reuse of rainwater sorted out, building enlarged; last but not least, a little animal farm has been set up, which is very popular among the youngest generation of visitors). Much of that work was done on volunteer basis. In the last year, these efforts have been followed by a little bit belated, but nevertheless welcomed action of the owner, Pilis Park Forestry Co. Ltd. This has led to the replacement of the whole roof, thermal insulation of the upper level, and repeated refurbishment of the kitchen, heating and electric systems. Besides these works on the house, a new – badly needed – biological wastewater treatment facility has been constructed. The renovated hut was inaugurated on 15th March 2014. How do you get to the Kő-hegy Hut? Well, the place is only accessible for the public via marked hiking trails, which lead here from various directions, among them Pomáz and Szentendre towns, as well as Dömörkapu and Lajos-forrás (the latter are trailheads that can be reached by car or bus). These are described in more detail on the hut’s official website. The approaches feature different sights along the way, so it is a good idea to combine the routes. If you are coming from Pomáz, right in the vicinity of the hut you will find the famous rock towers of Kő-hegy, including the small but distinctive "Mushroom rock", which is also known as Napoleon’s hat. Although, as far as we know, the French emperor himself did not pay a visit here, the shape of the rock does resemble his hat, which justifies the nickname. Not far from the hut, a small periodic lake is struggling for life (during prolonged droughts it regularly disappears, but the rainy periods help to refill it again) – also worth visiting. In the neighborhood you can find an interesting geologic phenomenon, the Vasas-szakadék, which is a narrow rock chasm hidden in the forest, formed by tectonic movements. The 2-3 m wide, about 40 m long fissure can be explored without any difficulty, but it is not meant for claustrophobic people. The latter sights will be along your way if you are approaching from Dömörkapu, but they can be incorporated into a little round-trip around Kő-hegy even if you arrived at the hut from another direction. Now let’s enter the building! From the terrace we enter into the lobby, which serves as a gateway to the spacious dining room. 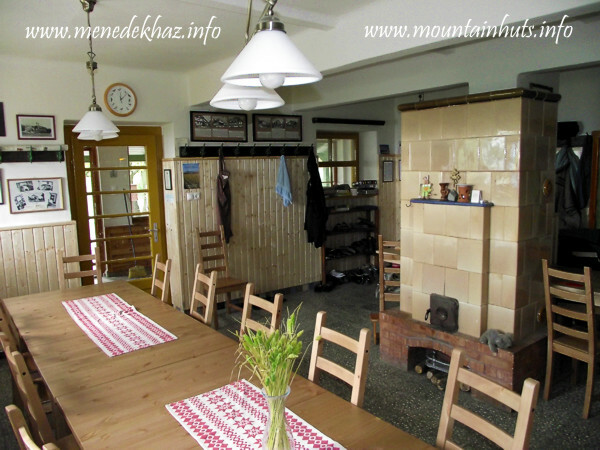 In the wintertime the diner is heated on a tile stove on whose walls we can study some old tourist and mountaineering relics, as well as historic maps and images of the house. At the other end of the room is the kitchen, where delicious meals are prepared. Actually, the food served here is another reason why many people have become fans of the hut. First of all, there’s the "rock soup". The funny name refers to the etymology of the place name, but otherwise this is one of the High Tatra huts’ classic meal: cabbage soup with sausage and sour cream. Nine out of ten mountaineers recommend it... :-) If, for whatever reason, this is not your favorite mountain treat, you can choose grilled sausage, or taste the Hungarian style "bread with lard". This is a very basic, but filling meal (lard spread on a slice of bread, with salt and onion). It may sound shocking if you haven’t heard of it before, but can become addictive if you get the hang of it. Judging from the hut’s guestbook, it is also clear that practically all kids (and many adults) are fond of the pancake made here... Further offers include refreshing home-made syrups and jams, chocolate and other snacks. The guests who are staying overnight can order breakfast and dinner as well, but this is arranged upon request. And if you prefer to cook something outdoors yourself, the Hungarian way (in a device called "bogrács"), the personnel can lend you the hardware that is needed for it. 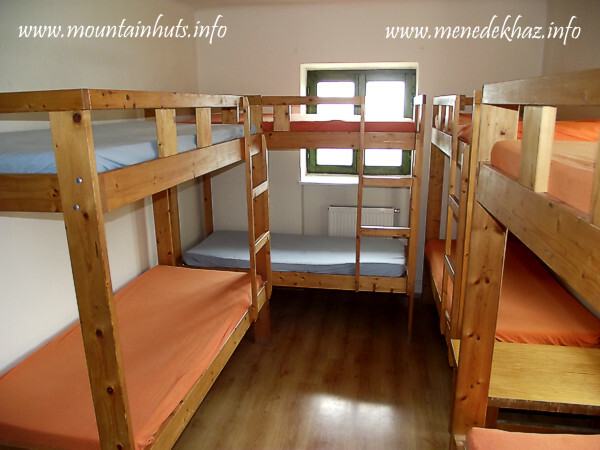 As for the lodging, dorms with 4 or 8 sleeping places (in bunk beds) are located on the upper floor, altogether having a capacity of 24 persons (in winter, the rooms are heated by central heating). There is a shared bathroom available for the overnight guests on the same floor. Given the hut’s popularity, it is advisable to book a place in advance if you are planning to sleep here. The procedure is as follows: Contact the hut via their website or by e-mail, and tell them the date of your planned arrival and departure, plus your special needs (whether you would like to order any meals or bring your own sleeping bag and do not need bed linen, etc.). They will send back a confirmation message as soon as possible, along with a bank account number and information about the sum that should be pre-paid as a deposit. Your booking will be finalized after this deposit arrives, and then it will appear in the online booking system of their website (by the way, before starting the procedure it’s a good idea to check there whether there are any places left). If there are no places available in the hut, or if you would rather spend the night in nomadic conditions, there is a possibility of renting a place for your tent in the surrounding meadow (bath use is included in the price). The only weak point of the Kő-hegy Hut is the scarcity of water. This situation is a direct consequence of the location: There are no springs on the top of the hill, and there is no connection to the drinking water distribution system, either. Therefore, the hut has to rely basically on rainwater (which is cleaned by top-notch reverse osmosis technology for the preparation of foods and drinks). If those stocks run out, the only option left is to bring water in tanks from the town. Thus, visitors must accept the fact that their water use has to be limited to the most basic needs, just as in any other hut with similar circumstances (i.e. in the Julian Alps or some places in the High Tatras – see our review of the Rysy Hut). However, this shortcoming can also be viewed as an opportunity: The visitors to the Kő-hegy Hut will understand better that water, and especially clean water, is of great value, and should be much appreciated, even in a country that has plenty of water stocks available. 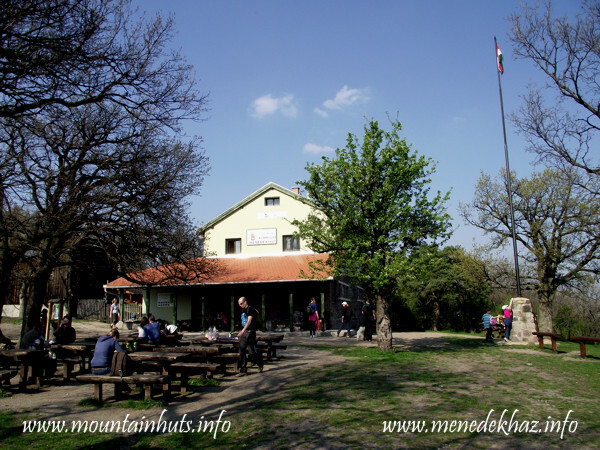 Summary: If you happen to be near Budapest and would like to check out an easily accessible, yet genuine mountain hut in Hungary, take a trip to Kő-hegy and visit the recently renovated, otherwise over 80-year-old building. The area is suitable for dayhikes as well as longer trekking tours. Either option you choose, you will surely enjoy the renowned hospitality of the hut’s crew (it is no accident that this place has evolved from a sorry state to one of the most popular attractions during the past few years). I strongly hope that the current team will be able to continue their much appreciated work in the forthcoming years as well, serving as a good example to other similar facilities across the country.